Offering comfort and convenience with added extras to make your stay memorable. We do offer reduced WEEKLY RATES - enter dates to see a quote. To check out our other highly rated cabin, see listing #877974. 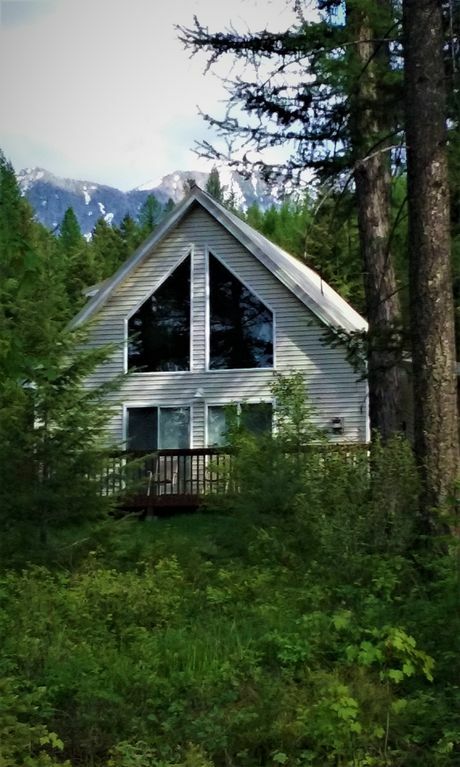 GENERAL DESCRIPTION - This freshly furnished & decorated vacation home is conveniently located in the village of West Glacier – gateway to Glacier National Park. Glacier Ridge Cabin is within walking distance of restaurants, shops, the Amtrak train depot and dining at the historic Belton Chalet (seasonal). Easy to find, the home sits away from it all on a forested ridge in a small residential area shared by several homes. Out the door you will find miles of Flathead National Forest land to wander on foot, snowshoes or skis. Glacier Ridge Cabin features a light and airy 1000 sq ft open floor plan with attached garage. The home sleeps up to 4 adults or children. With its exceptional location, recently renovated living spaces, fully-equipped kitchen, cozy gas fireplace, ductless air conditioning, 2 wide screen TV’s with Blu-ray players (Netflix provided), stereo/CD player with Bluetooth connectivity, WIFI, cell signal booster, Foosball table, deck with gas grill, fire pit and floor to ceiling windows, this house is a vacation retreat setting ready for year round fun and vacation memories to last a lifetime. Thoughtful attention to detail, quality and comfort have been paramount in putting together this vacation home for your dream vacation. Getting a good night's sleep is a key ingredient for the best vacation days, so we have endeavored to create a most comfortable sleep experience for our guests. The king & queen bedrooms both have top-rated Serta mattresses. Beds are furnished with 400TC quality sheets, down and synthetic pillows and layered bedding so you can get it just right. Open the windows for cool mountain night air and you have the recipe for a perfect night's sleep (or turn on the ductless air conditioning on those occasional warm nights). The upper floor is an open loft master suite with a king size bed and a half bath. Wake up to a bird's eye view looking towards Glacier Park through the cathedral windows. Features include a 31” wide screen TV, Blu-Ray disc player, and a recliner for TV viewing or relaxing with a book. The first floor bedroom has a comfortable queen size bed. Across the hall, the TV room with 42” wide screen TV and Blu-ray disc player provides a second, private living space to read or watch TV. The first floor full bathroom has a shower/tub combination. Sliding glass doors in the kitchen access the deck which faces Glacier National Park and offers a filtered view of peaks through the towering larch and fir trees. An attached garage serves as a game room for Foosball players of any age, laundry area and offers secure storage for your gear. Prepare a romantic gourmet dinner or a family meal and serve on Royal Doulton stoneware place settings. Or, set a pretty table on the deck with the colorful Melamine dishes and stemmed glasses. A full array of utensils, pantry basics, condiments and household supplies are provided. For making your favorite brew in the morning, you will find a Capresso coffee maker, coffee grinder, French press and electric kettle. Check out our resource file full of information on Glacier Park and area activities and attractions to help you with your trip planning (3 canisters of bear spray available for guest use). Packing a picnic lunch is a cinch with a cooler, reusable ice packs, and picnic dishes available. Take the beach towels and beach blanket along and stop at one of the pull-outs along Lake McDonald for some refreshing lake time. After a day of exploring, come home and build a crackling fire in the fire pit. S'mores, ‘wishing on the first star’ and sharing memories while gazing at the fire are a special way to wind down the day. This cabin is centrally located for day trips to the east side of Glacier Park, the North Fork, and area attractions to the west. It is 29 miles to Glacier Park International Airport and 25 miles to the hot spot Whitefish - home to an array of recreational activities, shopping, dining and nightlife venues. This location is perfect for year round fun in Montana’s great outdoors. Spend winter days exploring Glacier Park on cross country skis or snowshoes, cross country skiing on groomed area trails, downhill skiing at Whitefish Mountain Resort, or just snuggling up with a book by the cozy stove and enjoying the peaceful winter scene out the room sized windows. (Snowshoes provided at the cabin). September and October are quiet and golden with autumn color – a peaceful time to settle in and explore Glacier Park’s gifts. Open year round, we welcome you to Glacier Ridge Cabin while you explore the Crown of the Continent. Contact us now to book your Glacier Park dream vacation! (Going to the Sun Road access to Logan Pass closes approximately the 3rd weekend of October, weather permitting). We have been blessed with 39 years of exploring and recreating in the mountains, lakes and rivers of Northwest Montana. We are delighted to have the opportunity to create a home from which to share this wonderful part of the world with our guests. West Glacier is a great year round home base for exploring the splendors of Glacier National Park, Whitefish, Flathead Lake, Bigfork, Kalispell, the North Fork area and up to Glacier's sister, Waterton Park in Canada. We like the 'away from it all' feeling of this property with it's convenient year round access. Filtered views of mountains in Glacier National Park through towering larch and fir trees on the property. Local service on house phone. We also have a Samsung Verizon cell signal booster. Ductless A/C in living area. Cozy free-standing gas fireplace in living area. Attached garage available for secure storage of your gear. Also serves as the game room for Foosball players of all ages. Comfortable seating with views that bring the outdoors in. Gas range with oven (new in 2014). Full size (new in 2014). Coffee maker, coffee grinder, French press and electric kettle. Also a blender, hand-held electric mixer, and crock pot. Pantry of basics. Paper products and household supplies provided. Kitchen is well equipped to prepare and serve a gourmet romantic dinner or a family meal. 42' flat screen TV in 1st floor TV room with Blu-ray disc player. Wall-mounted 31' flat screen in master bedroom with Blu-ray disc player. Stream Netflix (provided) or your own subscriptions. Bluetooth connectivity, CD player & FM radio. Blu-ray disc players in TV room & master bedroom. File of information on area attractions for activity planning. Local reference and resource books also. Wood deck with seating for 6. Snowshoes are in the house for guest use (range of sizes).